the Fox Library, East Arlington's vibrant branch library. 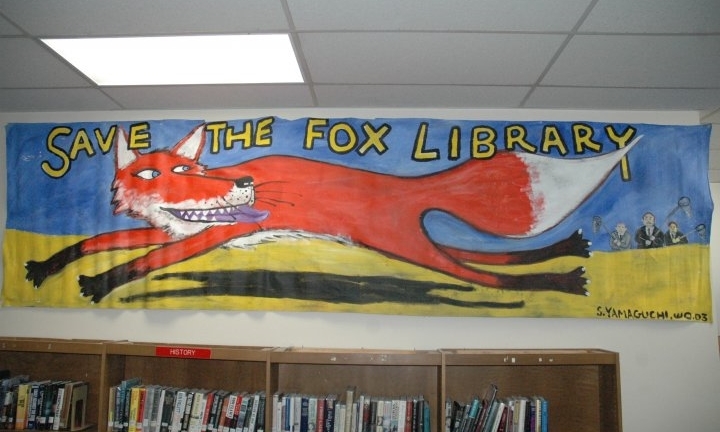 Founded in 2003, the Friends of the Fox Library was established to help move the Fox Library from perilous financial footing due to budget cuts to more stable ground. Now, in no small part and thanks to the Little Fox and the citizens of Arlington, the Fox Library is thriving with music programs, new furniture and computers, and Adult programming. The library is also now open on Saturdays! We are always looking for people to join the friends, to help with events, fundraising, and resource development. Please send an e-mail to FOXlibraryfriends@gmail.com for more information. At long last…In October, the Town of Arlington determined that a request for proposals would be required from any entities that wish to operate in the Shop space at the Fox Library. After long internal review by the Library Trustees, Town Counsel, and Library staff, a Request for Proposals (RFP) was posted December 26th. The Friends of the Fox is preparing a proposal; all responses are due by January 28. The RFP requires a resale shop that sends proceeds to the library, so no matter who wins the bid, a shop will be up and running this Spring. Thanks for your patience and continuing support for the Fox Library… please email FoxLibraryFriends@gmail.com with any questions or concerns. No-go! The Friends of the Fox is ready to go to reopen the Little Fox Shop - we only await permission from the Town to reopen in the space in the Fox Library. Hold tight, we’re sorry for the wait… please email FoxLibraryFriends@gmail.com with any questions or concerns. Statement from the Board of Directors regarding the Temporary Closure of the Little Fox Shop. Job Posting: Retail Manager, Little Fox Shop. The Little Fox Children's Resale Shop is temporarily closed, while we seek a new manager. We are very sorry for the inconvenience, and look forward to opening up soon. In the meantime, please hold on to your donations a little longer! For more information, please contact FoxLibraryFriends@gmail.com. The Fox Library and Little Fox Shop.